Available translators are limited to the basic task of translating a text from one language to another. That's why VocaDB Translator added a revolutionary function. 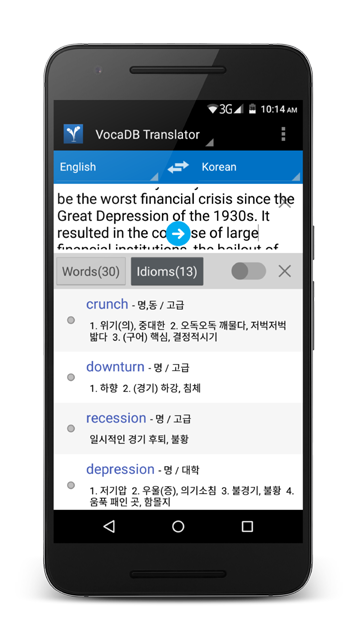 Aside from basic translation function, our Translation app is capable of generating a list of words and idioms extracted from an input text. It also provides vocabulary information relevant to language learners. The app supports 38 languages. It is powered by VocaDB's Translation with Word Extraction API and the APIs of Google Translate and MS Bing. All the best and enjoy coding. VocaDB Translator app is compatible with Andriod 4.1 (Jelly Bean) and up. 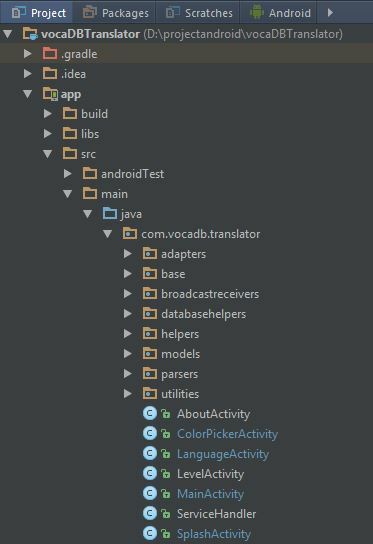 For more information about the configurations of the app, please check the build.gradle file under vocaDBTranslator/app. This section provides steps on how to import and run VocaDB Translator app on your workspace. 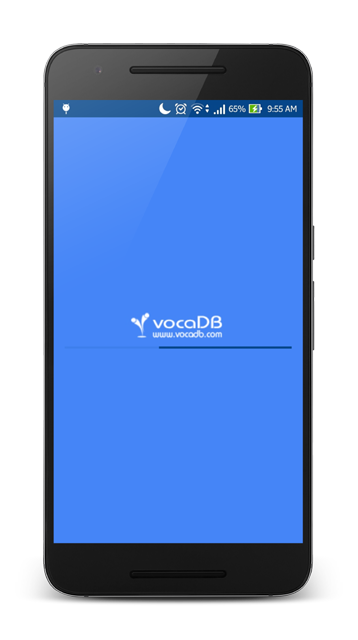 Select the VocaDBTranslator project folder with the AndroidManifest.xml file and click Ok. The app uses the AQuery library for doing asynchronous tasks and manipulating UI elements. Include the .jar file vocaDBTranslator/app/libs. This folder contains classes where other subclasses are derived. This folder contains classes that broadcast messages from other applications or from the system itself. 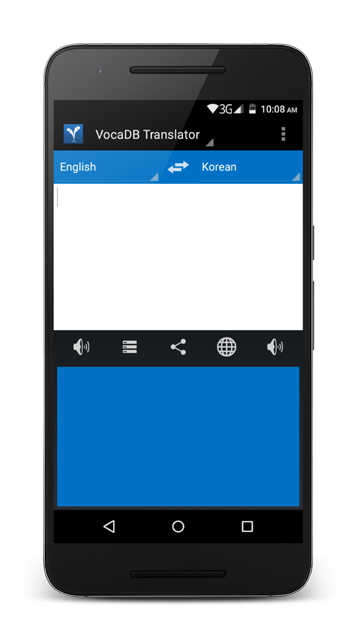 The basic function of VocaDB Translator app is to translate words or text to a specified language. English is the default language of the input text (source language or slang) and the search result (target language or tlang) but they can be set to another language. 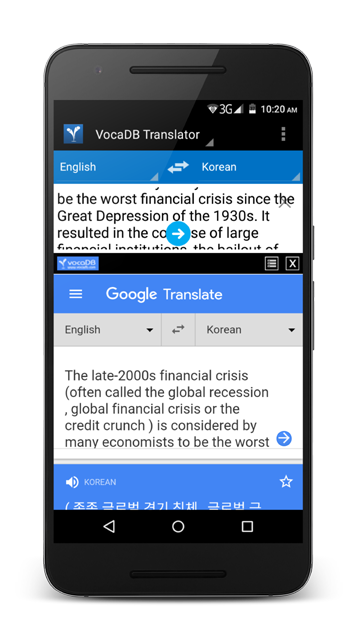 The app also has a language switcher button that allows 2-way text translation. 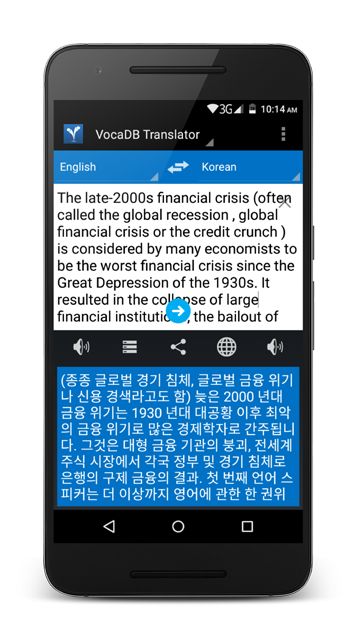 The app allows manual selection of source languages (slang) and target languages (tlang) to be included in the language drop-down list. 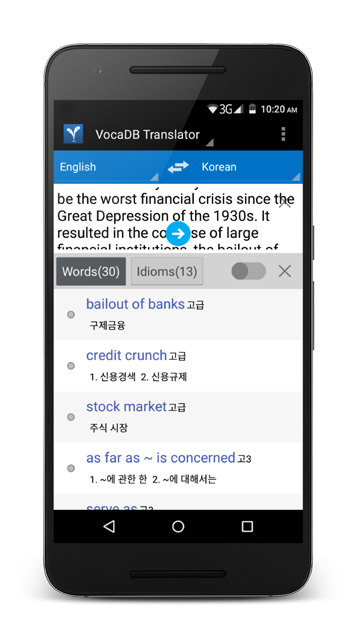 One of the revolutionary features of the app is that it can automatically extract words and idioms from an input text. The app allows manual selection of search engine to be used, whether Google or MS Bing. Color enhances user experience. The app allows personalization of the text color based on preference. The app also shows the list of previously searched words and text. The Translator API allows developers to make requests and get responses in JSON format.